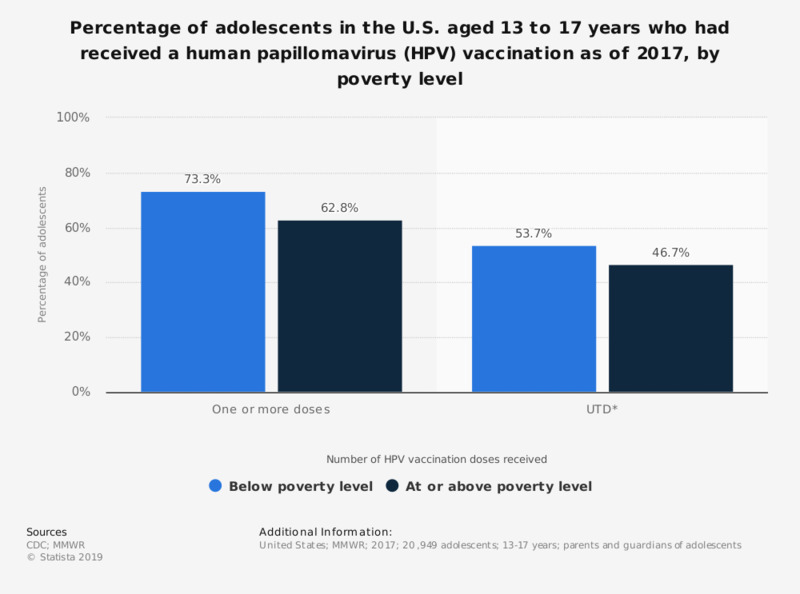 This statistic shows the percentage of adolescents in the U.S. aged 13 to 17 years who had received an HPV vaccination as of 2017, by poverty level. As of 2017, around 73.3 percent of teenagers below the poverty level had received at least one dose of HPV vaccination. Adolescents were classified as below poverty level if their total family income was less than the federal poverty level specified for the applicable family size and number of children aged <18 years. All others were classified as at or above the poverty level. * UTD = up-to-date. HPV UTD includes those with ≥3 doses and those with 2 doses when the first HPV vaccine dose was initiated at age <15 years and at least 5 months minus 4 days elapsed between the first and second dose. This update to the HPV recommendation occurred in December of 2016.